A Rwandan soldier serving as a peacekeeper in the Central African Republic (CAR) has shot dead four colleagues before killing himself, the Rwandan Defence Ministry has said. Eight others were wounded in the attack, a statement said. A Rwandan military spokesman called the incident "deplorable". 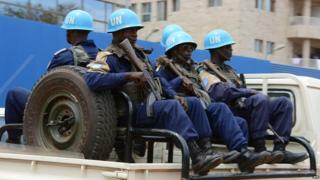 Those dead served under the UN's mission in CAR, deployed to support the country's fragile transitional government. The country descended into sectarian violence in 2013 when the predominantly Muslim Seleka rebels seized power, prompting reprisals from Christian militia. An investigation was under way into the incident, which took place in the CAR's capital Bangui, said Brig-Gen Joseph Nzabamwita. "We suspect terrorism without ruling out mental illness to be the cause," he said.